We are almost at the end of October! I think that next Friday (November 1st) I will do a long post showing the “Whole Garden” pictures from May through October. 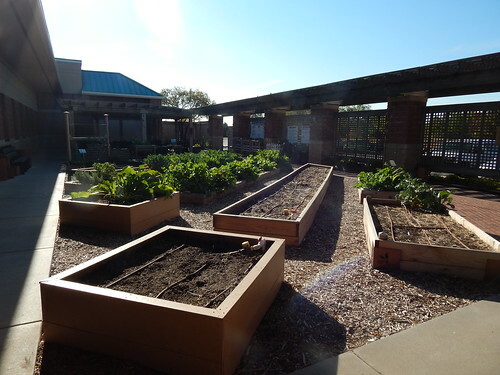 I think it will be pretty neat to see the garden change over the whole season, because sometimes the difference isn’t very noticeable from week to week. As you can see, the sweet potatoes are gone. From this picture, you can’t really see the open places where many of the flowers were removed as well. 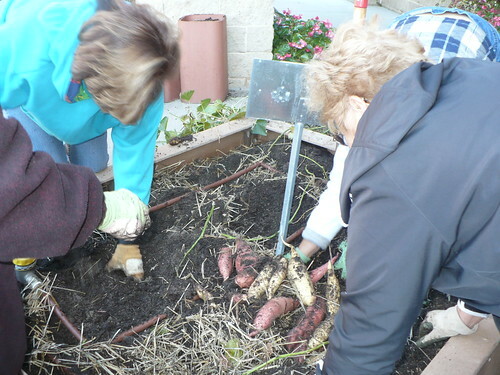 Speaking of digging sweet potatoes – here is the dig in progress. It’s a little bit different than using the tractor and harvest machine down at the Pair Center! It looks like we managed to grow some nice sweet potatoes. 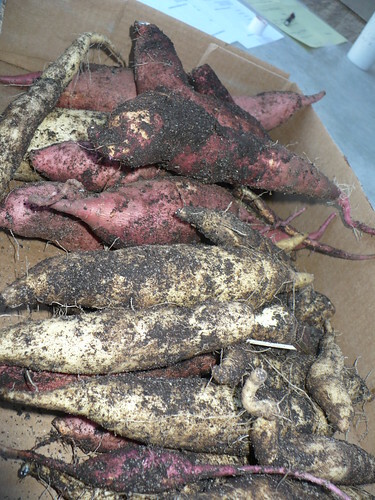 The sweet potato harvest looks good, although not particularly spectacular. I am wondering if we should have planted more slips, if we needed to fertilize/water more, or if this is actually a reasonable harvest from a 16 sq. ft. area? Now that I think about it, it may very well be reasonable. 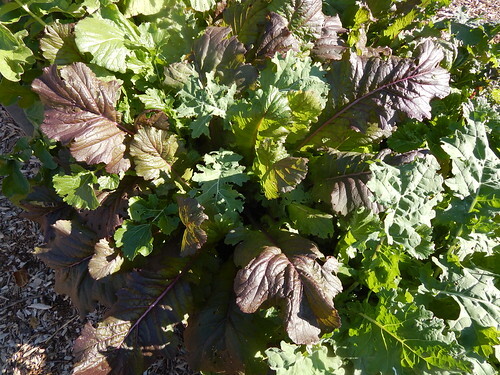 This was supposed to be part of the fall salad greens planting, and while I suppose you could still use them for a salad, they are much more the size of braising or cooking greens now. The colors were pretty this morning in the sun. 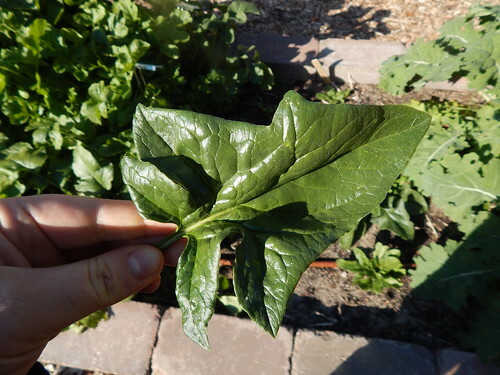 Speaking of greens, the spinach plant that survived from the first planting has some huge leaves! They are pretty pointy, which I’m not usually a fan of (sign of bolting), but the flavor was very sweet and good on this leaf. Yes, I picked it, took a picture, and then ate it. 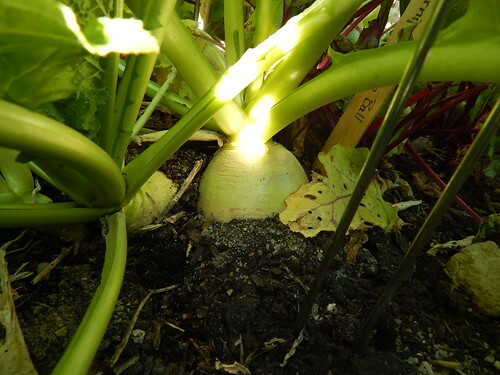 The turnips and fall radishes keep growing and growing. Some of them are nearing harvest stage, while others are lingering at a smaller size. Mmm….turnips! Posted on October 25, 2013, in PhotoEssays and tagged fall, fall garden, greens, radishes, salad greens, sweet potatoes, Turnips. Bookmark the permalink. Leave a comment.